This weekend we had two friends visiting from Toronto, it was so nice to catch up and chat since we hadn’t really seen either since the wedding. The weekend was full of delicious food and drinks and we had such a good time, even though the weather didn’t really cooperate. Today was still a bit chilly so I decided to make a soup for dinner. 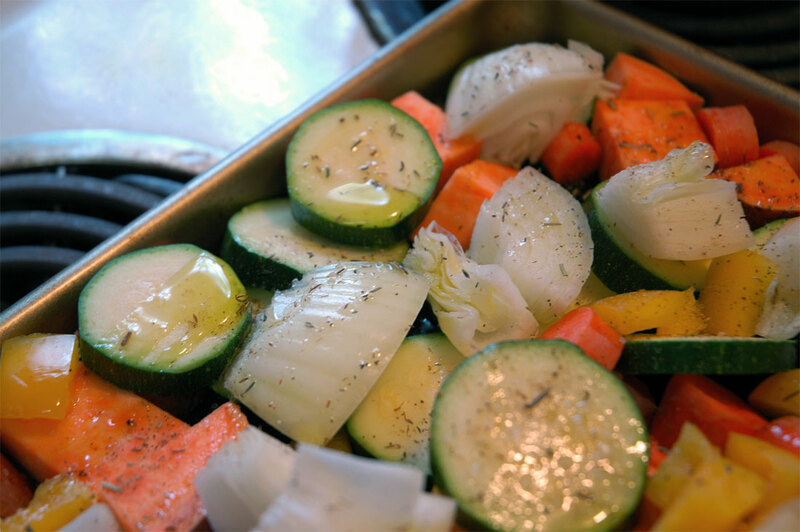 Roasting vegetables is now my go-to for an easy dinner option. They work well as a side or in a soup and the best part is you can pretty much use whatever you have in the fridge. 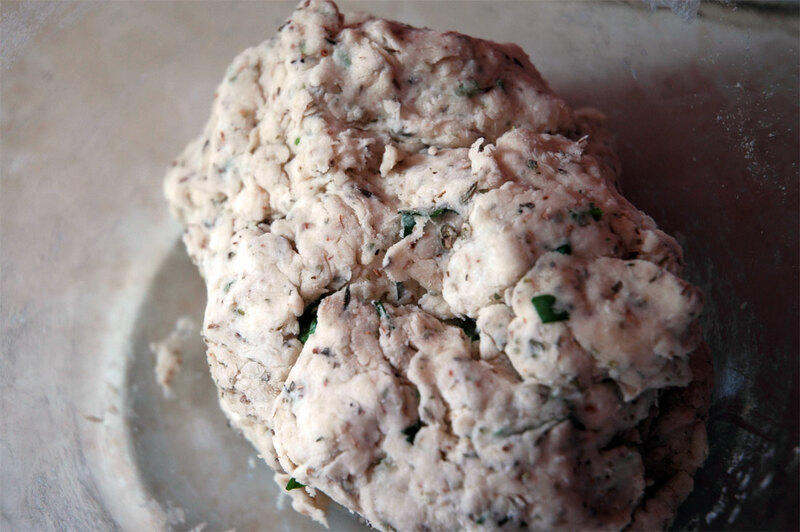 I wanted to add a little something to it though, and came across this recipe from theKitchn that suggested dumplings. I’ve made dumplings once before and it went well so thought I’d give it another try. All-in-all it was pretty tasty but I think I would have preferred fresh bread instead. Oh well, you live and you learn. Check out the recipe below. Cheers! Preheat oven to 400°F. 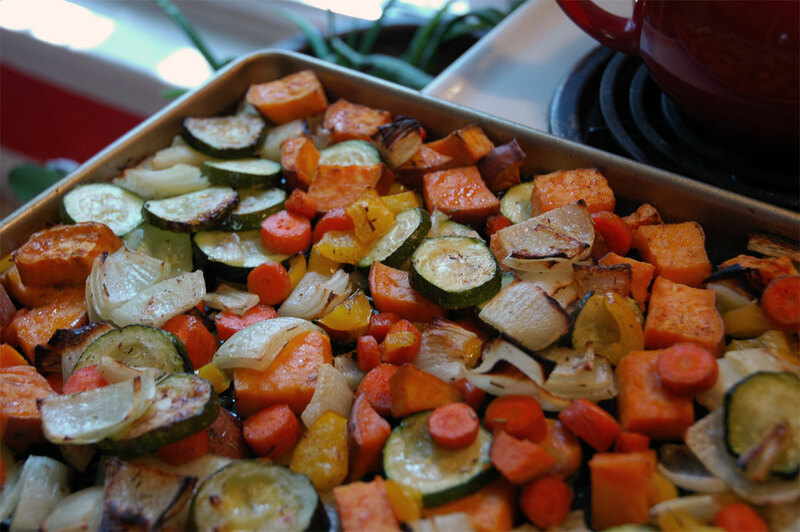 Cut up all the vegetables into 1-inch chunks and spread onto a baking sheet. Leave the garlic unpeeled and place on baking sheet as well. Drizzle with olive oil and then sprinkle with salt and pepper and herbs. Roast for about 40 minutes, flipping them half way through. Squeeze the roasted garlic from the skin. 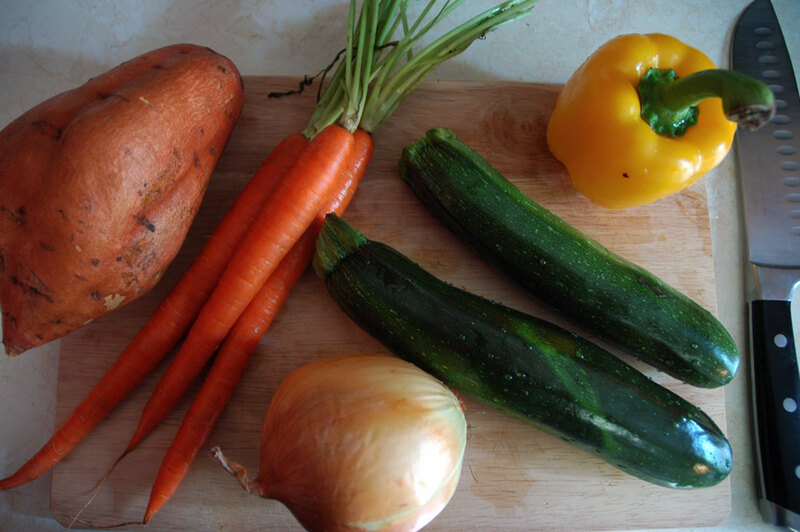 Bring the broth to a boil, add the vegetables and garlic, and then puree with a hand blender until you reach the consistency you like. While the veggies are roasting you can prepare the dumplings. In a bowl mix the flour, baking powder and salt. Next mix in the butter bits with your fingers until the mixtures resembles fine crumbs. Stir in the herbs and then add the milk and mix until combined. 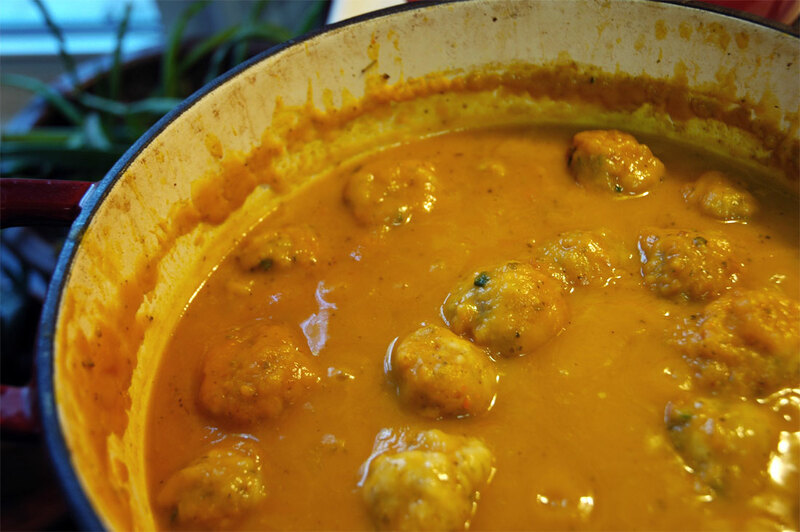 Drop blobs of the dough into the simmering soup (they expand so don’t make them too big). Cover the pot and simmer for about 10 minutes or until the dumplings are cooked through. Bon appetit!